Oh and PS, also got into a similar argument with my co-author of my current book with the use of the word “remediation”. We can’t get away from it. Hiya Mark, I think the problem also relates to the way we have conceived (at least for many, many years) “teaching” – again with reference to the locus of control. When looking up “didactic” in e.g. Merriam Webster it means “intended to teach”, but what’s interesting is the list of synonyms and related words – hardly any of these have positive connotations … Since the late 90’s the discourse here in DK changed, and “learning” has been on the agenda. 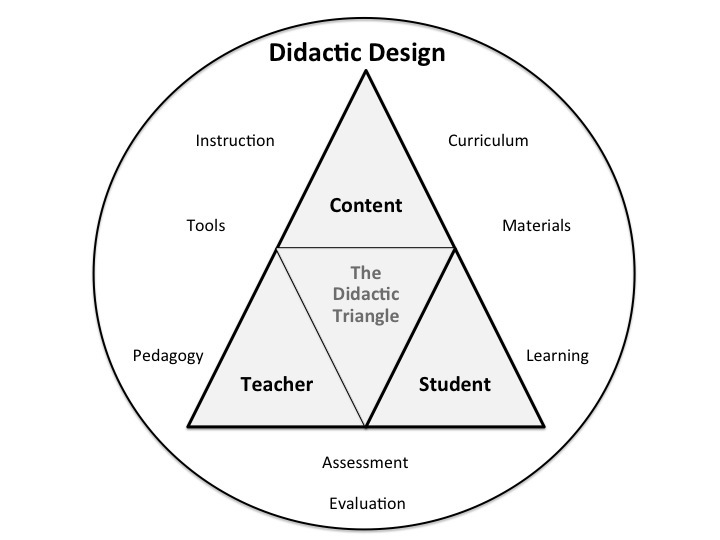 This was much needed, but my personal sentiment is that somewhere along the road much research ended up ignoring the Elephant in the room: the teacher – and teaching ;-) If we recognize the premise of the Didactic triangle, we need to consider both parties. 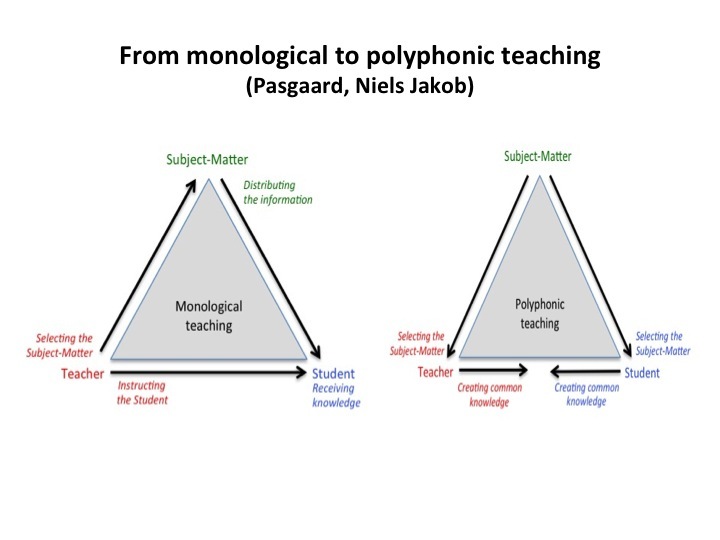 I understand perfectly why you would switch my definitions and consider pedagogy more inclusive, and I know several of my Danish colleagues (especially those who don’t originate from the field of teaching) would agree. My “problem” with pedagogy is that it often is used in relation to children and youth, which again has to do with its etymology (cf. the rise of alternatives such as andragogy and heutagogy – and even avagogy!) .. Oh, the joy of Humanities … phew, I get your frustration! Westbury, I.; Hopmann, S. & Riquarts, K. (2000) “Teaching as Reflective Practice. The German Didaktik Tradition”. Routledge. Uh, that’s a discussion I’m looking forward to learning more about. I’ve got problems with that concept as well. I’ve tried to stay faithful to the way Bolter & Grusin (1999) use the concept. The problem being that they don’t even have a clear definition. Oftentimes, when I have presented my research, I’ve been asked if by remediation I simply mean representation – and I do – and don’t! Bolter & Grusin use a number of synonyms incl. representation to explain the concept – making it quite confusing and unclear. In the glossary of their book, they define it as the logic by which new media refashion prior media. I guess, they could have used representation instead of refashion, but to me representation is less dynamic – this could, however, be attributed to the fact that I’m not a native English speaker .. making it all the more difficult, sigh .. An important point, is also that Bolter and Grusin use the term in close relation to media and medium theory in general. I think this blog post will make a great section in your thesis, for all concerned. Ditto with a lot of your previous posts. Pedagogy and remediation are also words fraught with difficulties in English-speaking parts of the world. Both can have negative connotations in some sectors. By clearly explaining the differences in meaning (vs Danish) I think you do a great service. Many years ago I sat by a UCLA Education prof (whose work I had read with interest) on a flight from DC to Phoenix. He researched kids and technology, with the kid’s movement acting as if they were the computer mouse, with their movement generating the pointer movement on screen. Or some such. His thinking was very much in the cultural mode. When I mentioned Andragogy, he admitted to never having heard the term. This even when there were experts on the subject in his own (admittedly large) department. He said they rarely communicated.